Breakfast is best served family style, with large platters of food spread across the table, where everyone can help themselves to a huge variety. 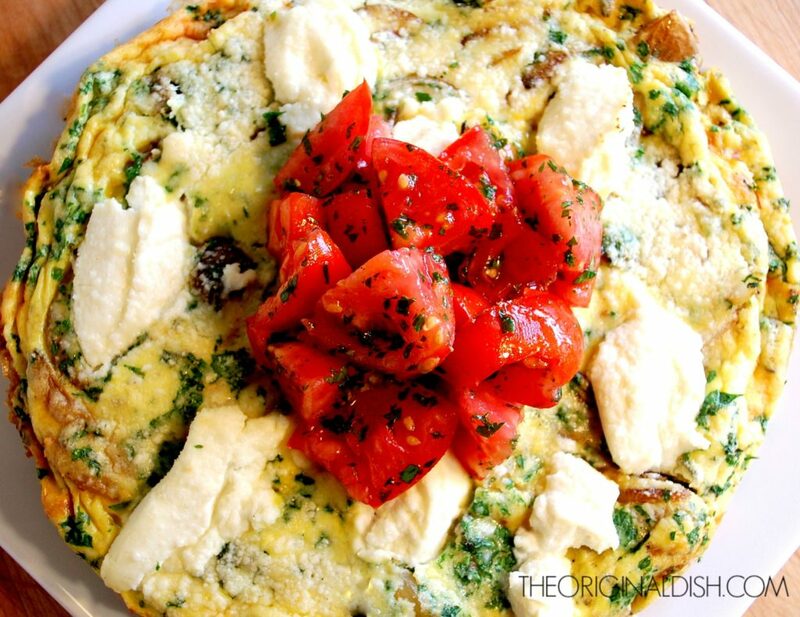 There is bound to be one or two egg dishes found on that table, and a frittata is the ideal one. Just like a pie, it’s easy for people to slice off a piece in any size they want. And the best part? 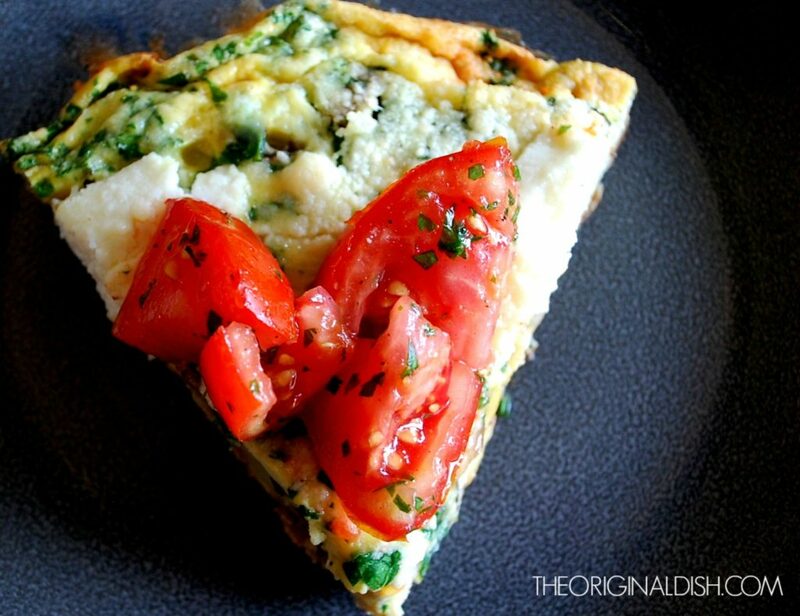 You can add basically anything you have in your fridge to a frittata: vegetables, fresh herbs, any kind of cheese, etc. The possibilities are endless, making it a versatile dish to whip up. I like having some sort of starch in my frittata, something to add substance to the dish. I sauté diced potatoes to crisp them up, while simultaneously caramelizing onions. Fresh sage is added to the pan, releasing all of the fragrant oils within the herb. I blend eggs with more herbs and sharp Pecorino Romano cheese, which gives the dish a salty bite. A little half & half creates a smooth, creamy egg mixture that gets poured on top of the potatoes. After the eggs cook about half way on the stove, I dollop the entire thing with ricotta cheese and transfer the pan to the oven. After only about 5 more minutes, the frittata will be golden brown and ready to slide out of the pan and serve! It’s as easy as that. 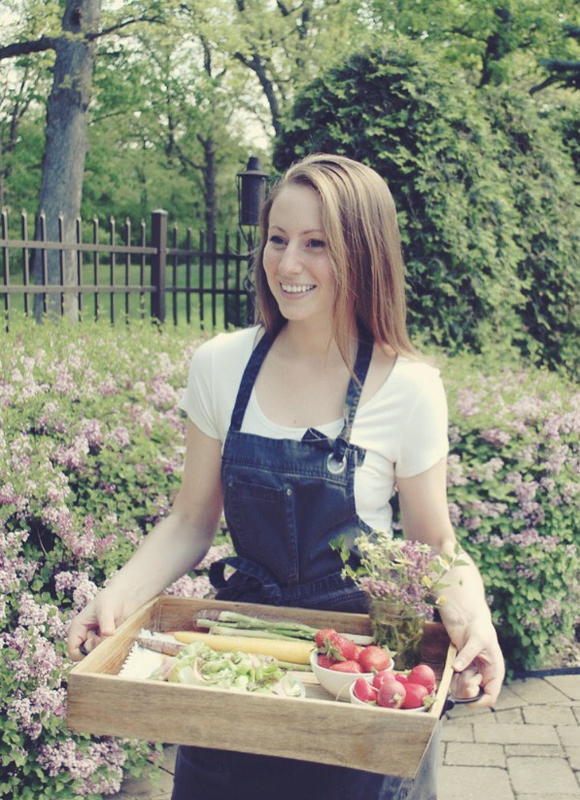 The finishing touch: a beautiful, easy topping of fresh garden tomatoes tossed with olive oil and parsley. Preheat the oven to 425°F. In a 10-inch sauté pan, heat the olive oil over medium-high heat. 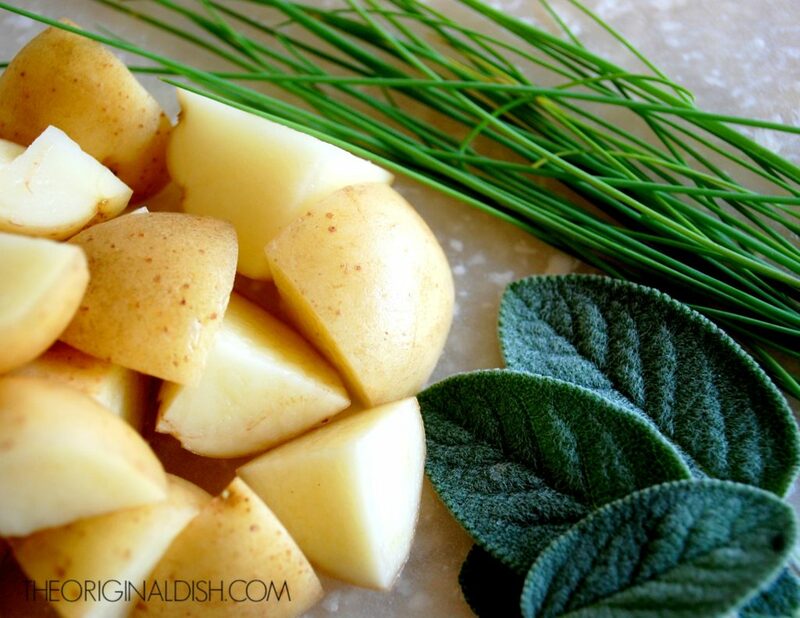 Add potatoes and season well with salt and pepper. Cook for 3 minutes, lower the heat to medium-low, and add the onions. Season again, and cook until the onions are soft and caramelized, about 10-12 minutes. Stir in the sage. Meanwhile, combine the eggs, half & half, salt, and pepper. Beat well. Whisk in the parsley, chives, and 2 tablespoons of Pecorino Romano. Pour this mixture into the pan. Stir gently, but do not let the eggs scramble. 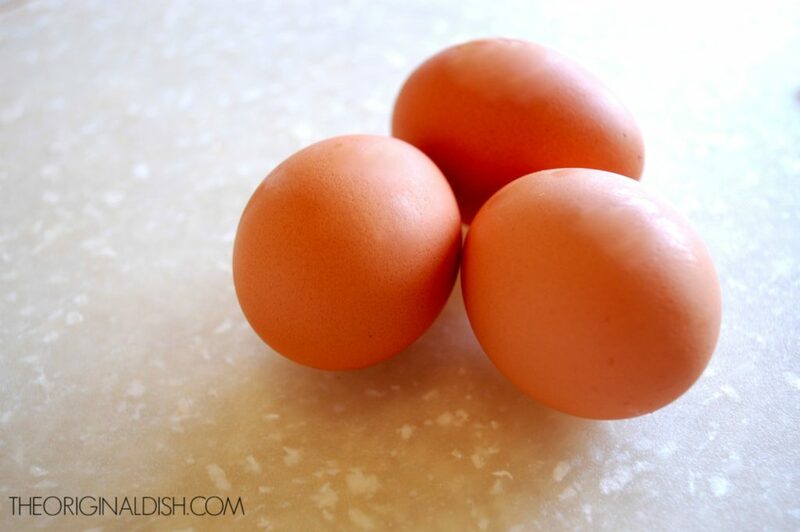 Let the eggs cook undisturbed until they set around the edges, about 3-4 minutes. Sprinkle the remaining 2 tablespoons of Pecorino Romano over the top and dollop with ricotta. Transfer the pan to the oven and cook until the eggs are completely set, about 5-6 minutes (see notes). In a large bowl, toss the tomatoes with the olive oil, parsley, salt, and pepper. 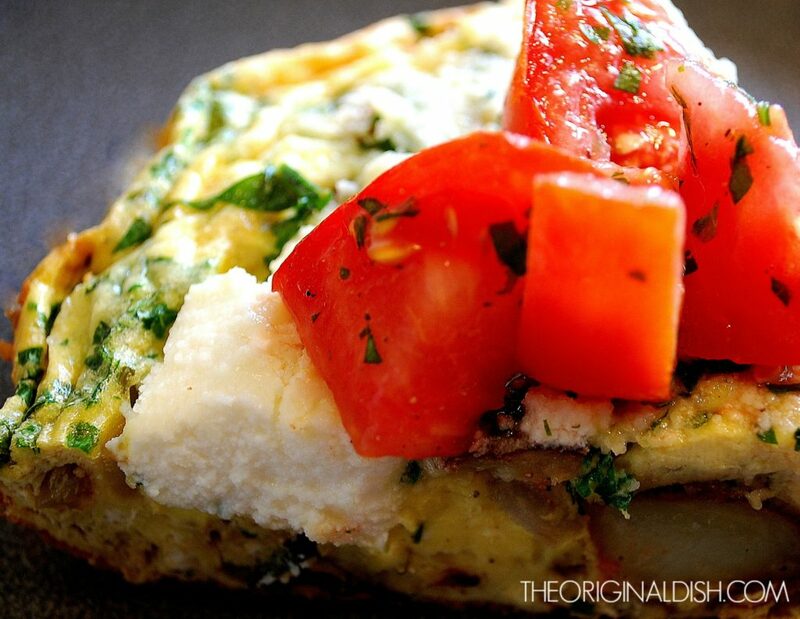 Loosen the sides of the frittata with a spatula and slide it out onto a platter. Cut a piece and garnish with more Pecorino Romano if desired. Season to taste. Top each piece with the fresh tomatoes. Depending on a variety of factors, the eggs may cook differently, so keep an eye on the frittata as it bakes. Insert a toothpick in the center, and if it comes out runny, keep cooking until the toothpick comes out dry.